Festival in which this many Mikoshi (portable shrines) gather can be seen only in Koriyama-city in Fuushima prefecture. 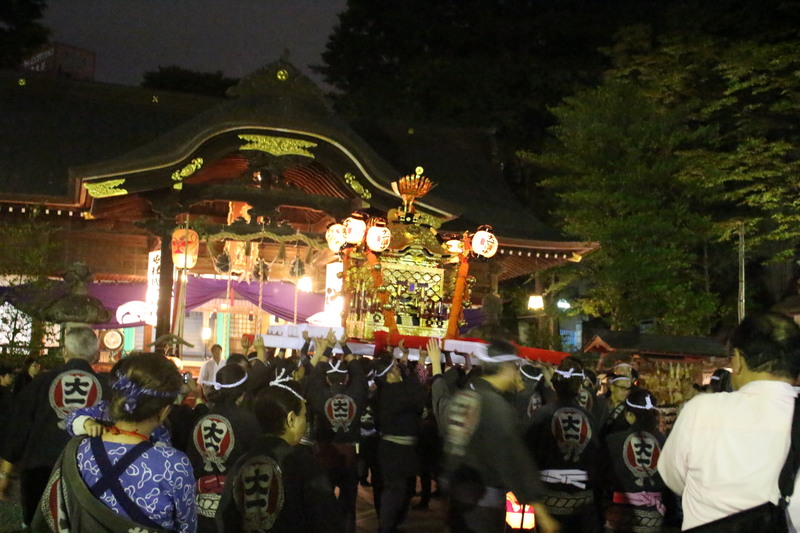 Annual Autumn Festival of Asakakunitsuko-jinja is known as “Hachiman-sama” in local community. 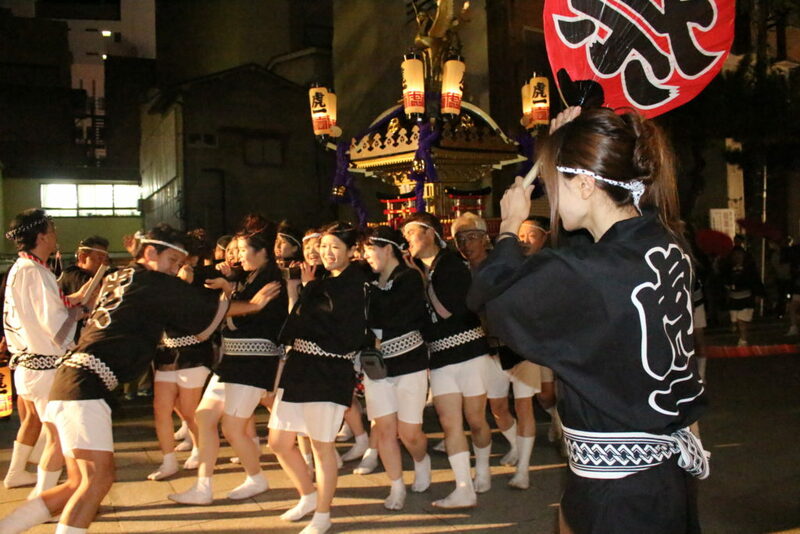 The festival was held for three days from September 27th this year with big cheers of “Wasshoi”. 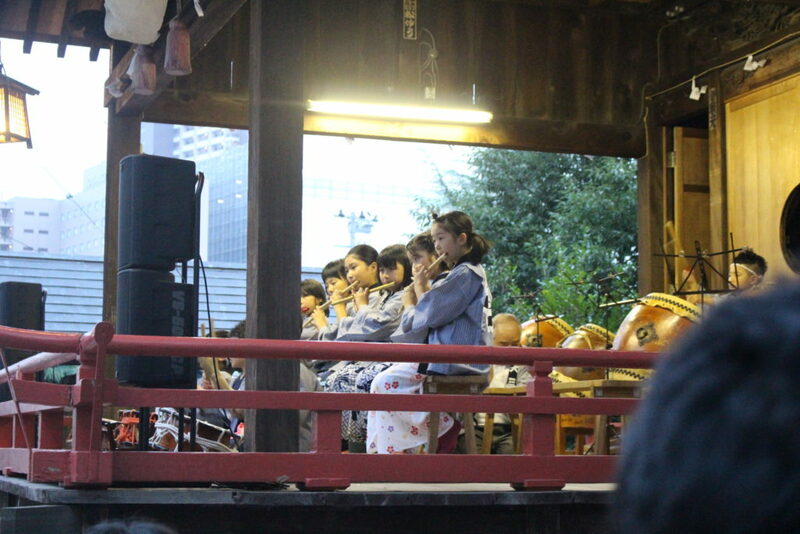 We covered “Ohayashi”, “Dashi-matsuri”, and “Mikoshi togyo and Kangyo” this time. 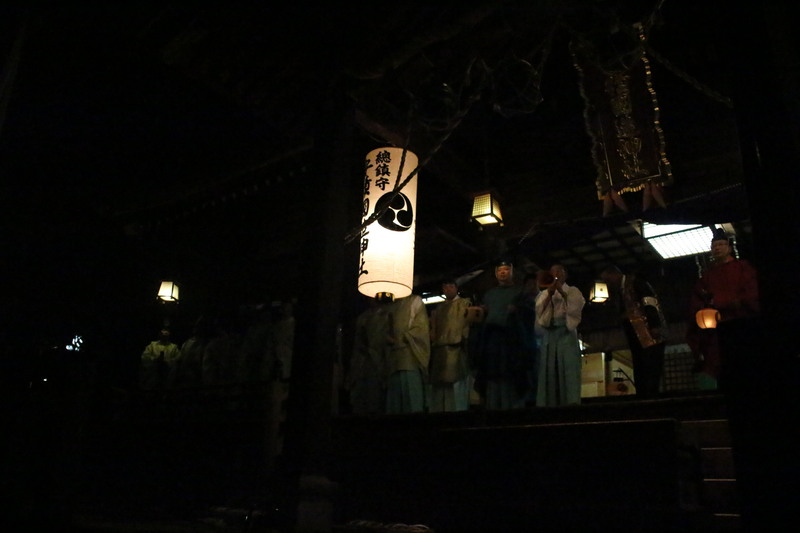 We will also introduce history of festival for those who are not familiar with this festival very much. 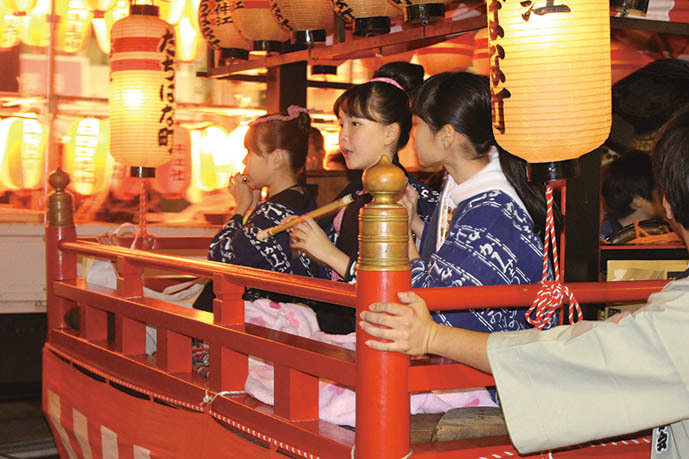 Festival has been held since ancient times, but Mikoshi and Dashi started to show up only in the Edo period. 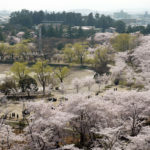 Koriyama was a post town with population of 5,000 in the end of the Edo period, and Hachiro Kiyokawa said it was “the first post down in Mutsudochu” in his travelogue. 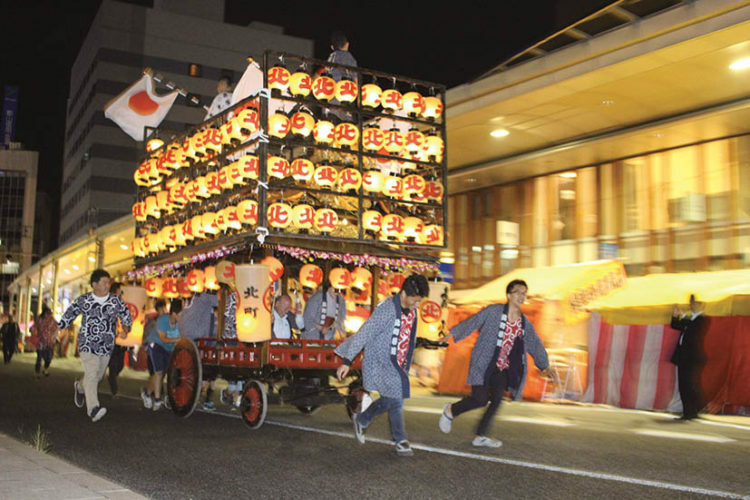 The big festival was held as Koriyama was a bustling post town, and Dashiyatai started to be seen in the middle of the Edo period. 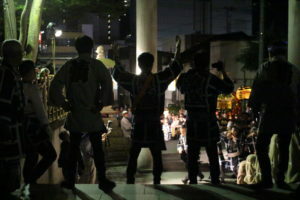 In addition, local residents offered holding of “Mikoshitogyo” to Nihonmatsu Domain (Koriyama belonged to Nihonmatsu Domain at that time). 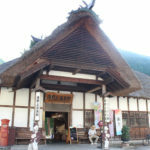 Mikoshitogyo started in 1765 after receiving an approval from the domain. 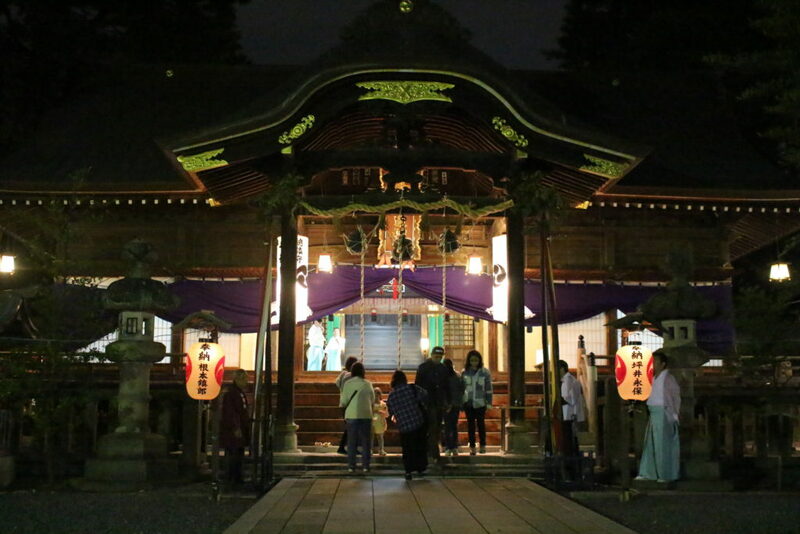 Since Asakakunitsuko-jinja’s status was especially high, using the lord’s Kamon (Chigaibo-mon) was approved and it is still hung in the shrine building with Tomoeno-gomon. *What are Togyo and Kangyo? 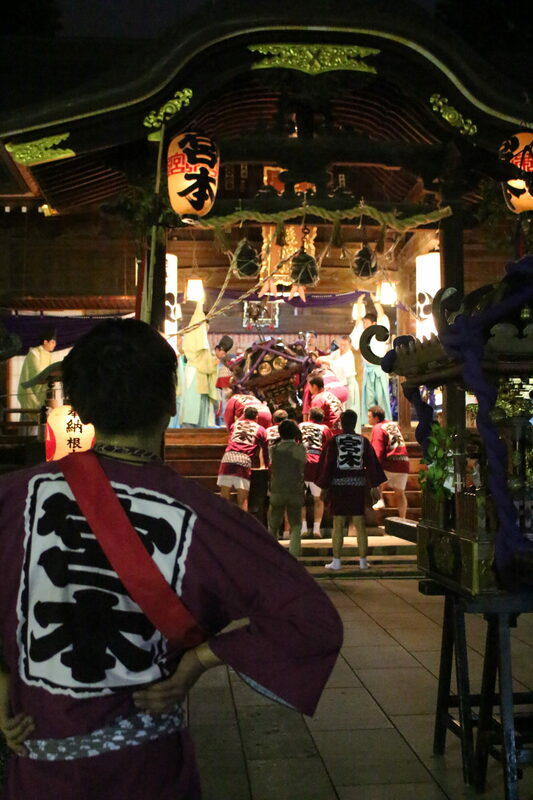 “Togyo” is a ceremony in which the deity of god goes around an area on a portable shrine called Hon-Mikoshi. 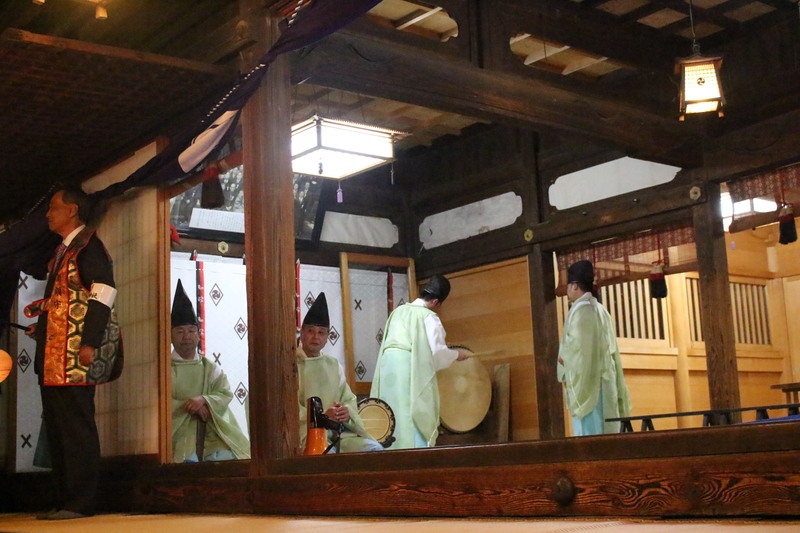 “Kangyo” is a ceremony in which the deity of god returns to shrine building through Omotesando after 3 day of Togyo. 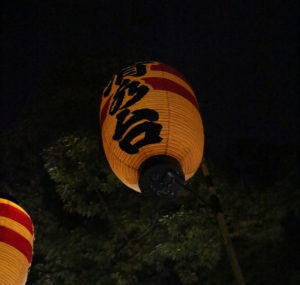 What kind of festival is Annual Autumn Festival? 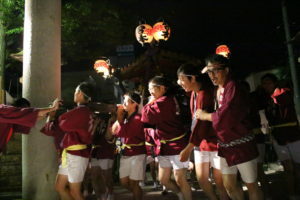 The deities of “Yahata-no-Okami”, “Inari-no-Okaim” and “Asaka-no-Okami (Asakakunitsukohitonenomi)” of Asakakunitsuko-jinja are transferred to Mikoshi. The bonds between gods and local people deepen and merits of the deity spread widely. It is a festival of giving thanks to god for rich harvest and praying for local safety. 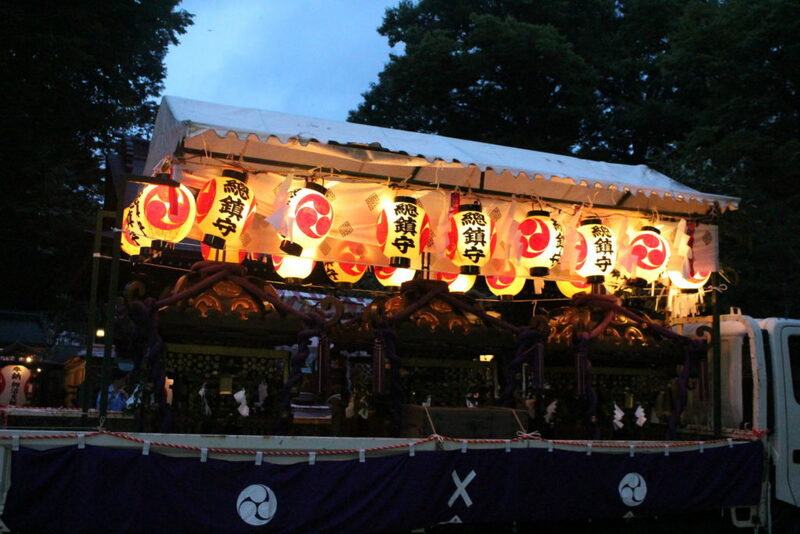 Hon-Mikoshi refers to three Yashiro on which gods ride on. Gods’ amulets are placed on Mikoshi other than Hon-Mikoshi (totally 34-ki this year). 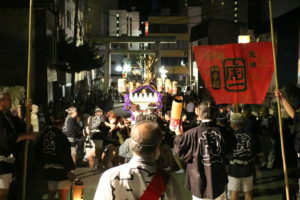 As movement of Mikoshi is unpredictable, people other than those concerned are not allowed to touch for safety reasons. It is not allowed to throw water on them as well. Basically it is now allowed to see Mikoshi from above either. 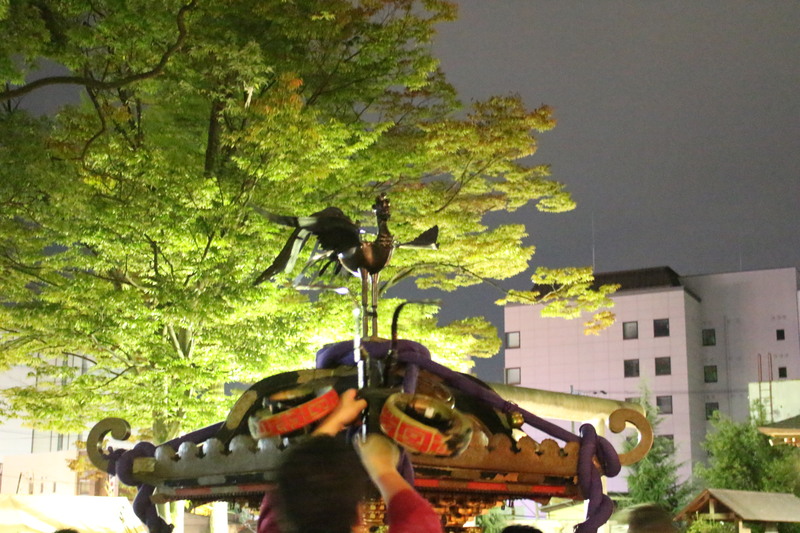 *We use “Ki” to count Mikoshi in which gods’ amulets are placed. 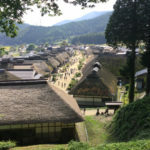 The town has been divided along Omotesando to the shrine and Daikan-koji into south (Kami-machi) and north (Shimo-machi) since the middle of the Edo period. 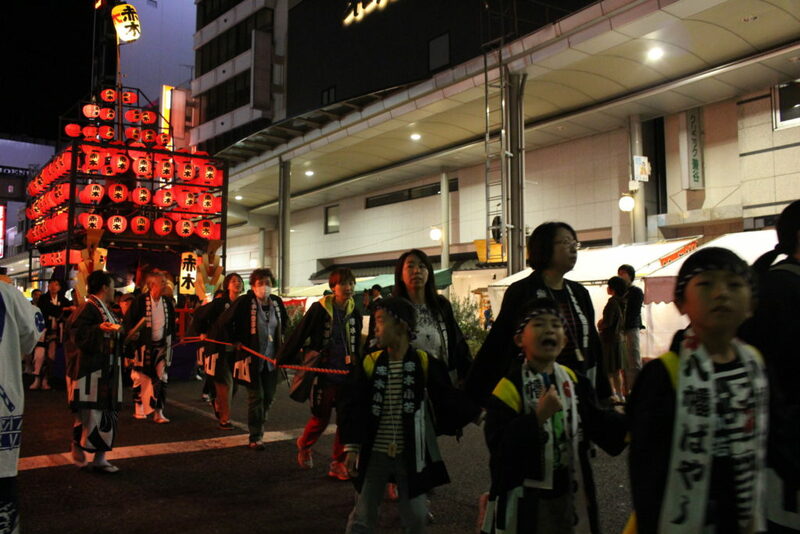 Starting point of Kangyo switches between Kami-machi and Shimo-machi every year. 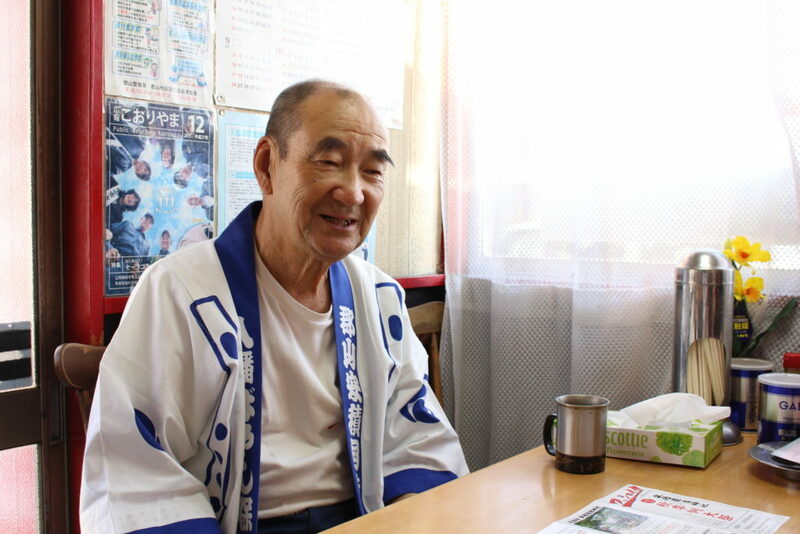 Miyamoto is the town council around Asakakunitsuko-jinja and is responsible for Hon-Mikoshi’s Kangyo. 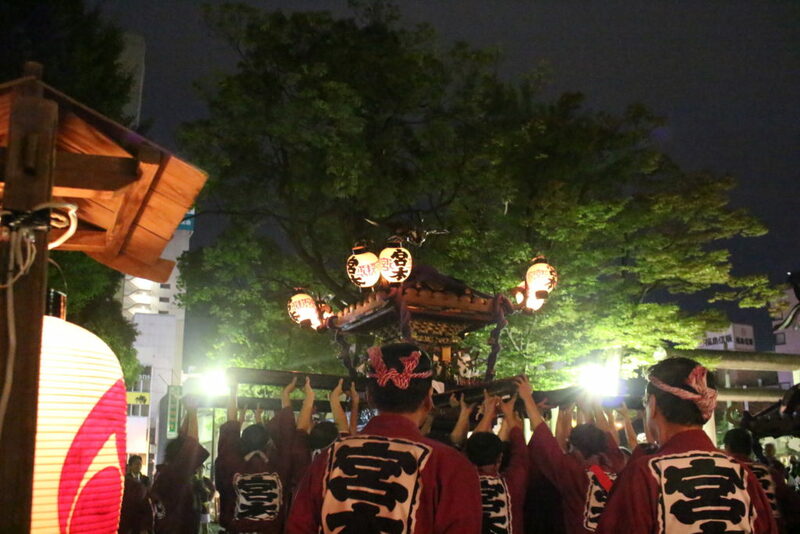 In each Mikoshi’s front and back, there is a person carrying Takahari-lantern and a person carrying Atozume-lantern. 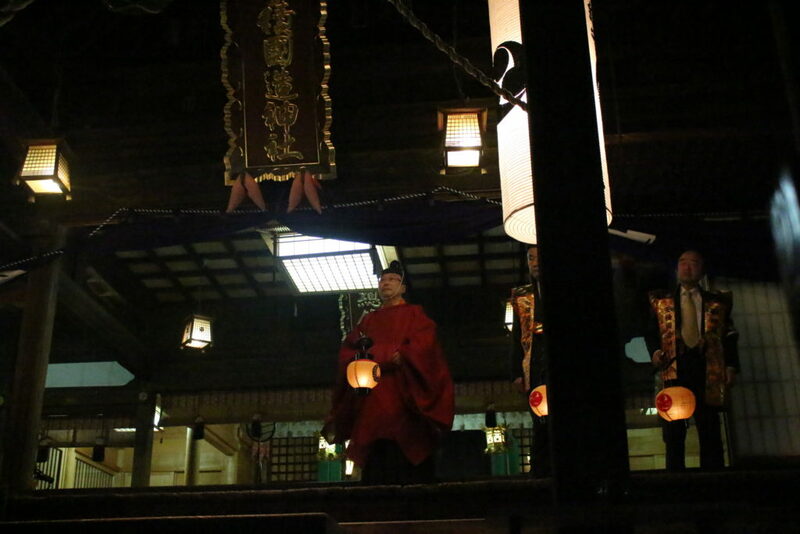 The area between these two lanterns is Mikoshi’s position. It is said that Takahari’s stick is long in order to overpower others in the forward bending posture. “Lantern” can only be moved forward, so a person holding lantern takes an important role of bargaining with other Mikoshi when main road in front of the station is crowded with Mikoshi. 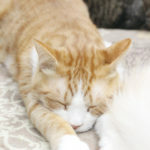 It is said that some conflicts occurred due to scrambling for positions. 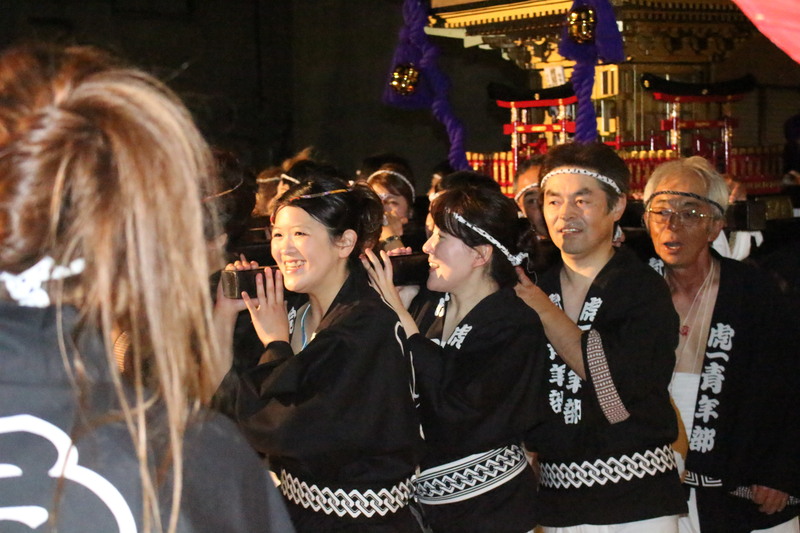 Mikagura is the formal ritual dances associated with Japanese Mythology that has been handed down in Kojiki and there are 36 programs. 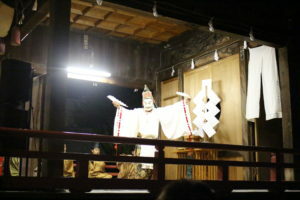 Juni Kagura is performed in Mikagura hall only once a year on 28th and 29th of the festival days. You can see many familiar gods performing dances there. 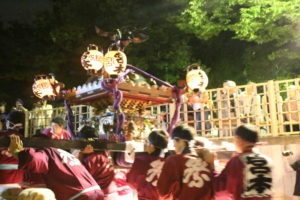 Ko (organization) that belongs to each town council of Asakakunitsuko-jinja’s ujiko shall carry Mikoshi. Only Asakasuiren is a club-like Ko (organization). 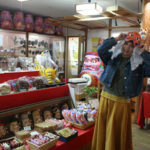 *We interviewed people from Honikko* about Ohayashi. 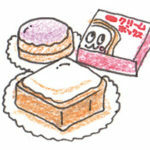 “Motoichi” means Moto-machi 1-chome. 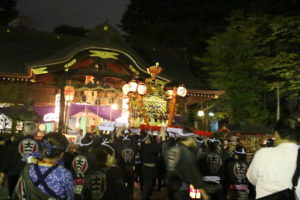 “Ko” refers to the organization who is responsible for festival in each town. How many times do you practice before festival? Children are performing but how do you teach them? 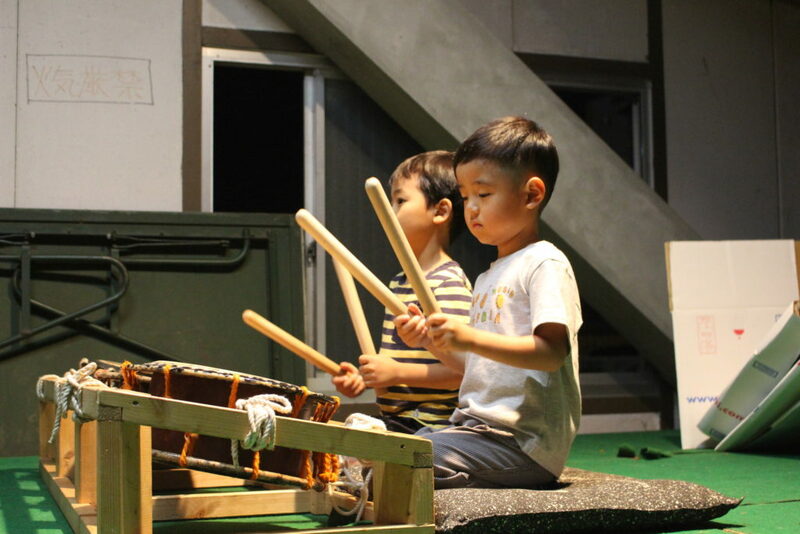 Children between 3 years old and 15 years old participate in performance. 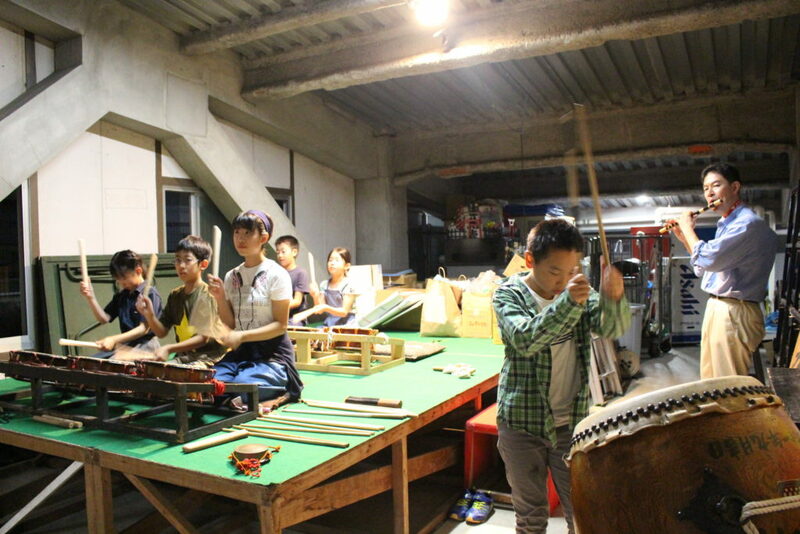 Some of them have no music experiences so we start from showing them actual musical performance. We also teach adults, but children learn to play gradually by copying senior players. What kind of instrument do you use and how many songs do you play? We have small drums, large drums and flutes. 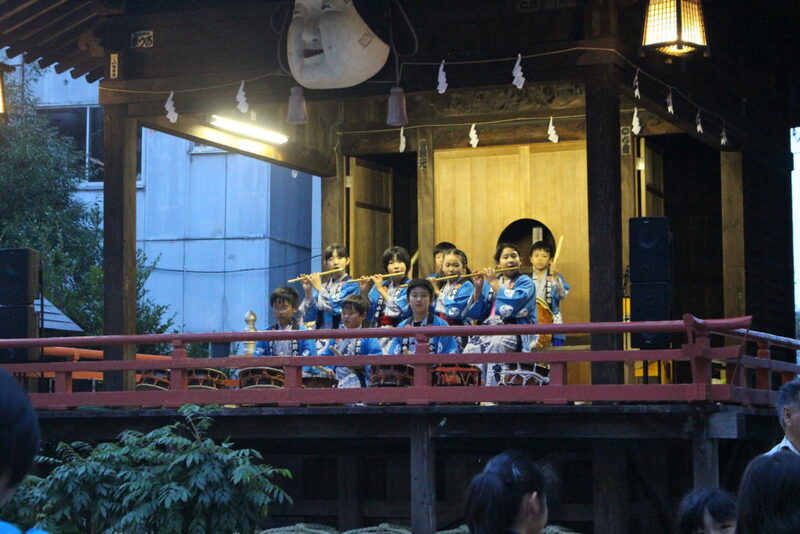 We play three songs of “Shangiri”, “Okazaki”, and “Kakube” from Nihonmatsu’s Matsuri-bayashi. 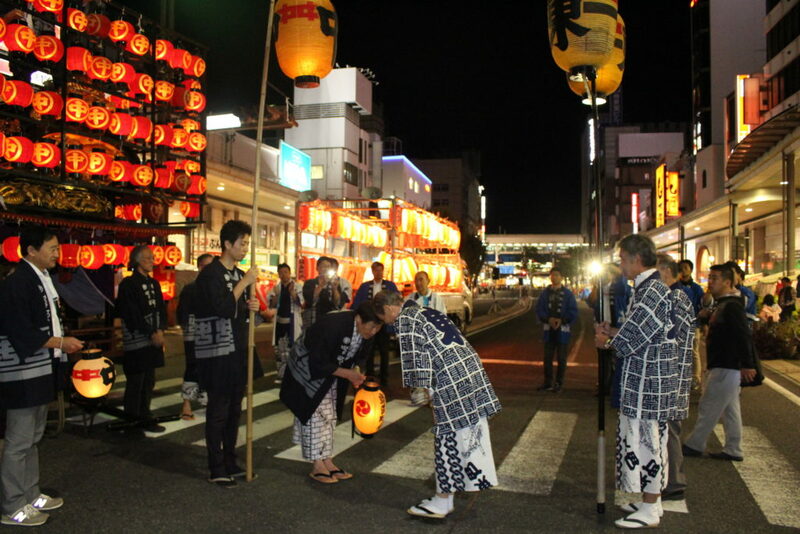 *”Each town council other than Honikko is playing “Hachiman-bayashi” which Yoshikazu Sato, a performer from Asakakunitsuko-jinja and Shinji Saito from Nihonmatsu Takeda arranged Nihonmatsu’s Matsuribayashi. There are total 4 songs. 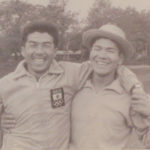 What is exactly the attractive point of “Ohayashi”? 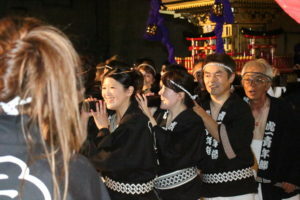 Ohayashi takes an important role of cheering up the whole festival. 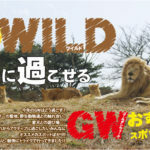 Ohayashi has the power to attract people naturally and we feel that the songs are still flowing in our minds for a week even after festival is finished. Do you have any difficulties? It is difficult to maintain “festival” including maintenance of the instrument. 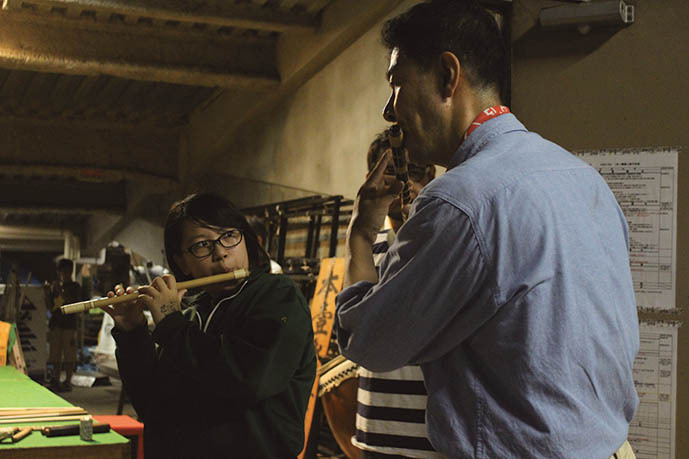 Playing big drums and flutes is especially difficult so senior players are teaching young players with patience. What are the pleasures of the festival? 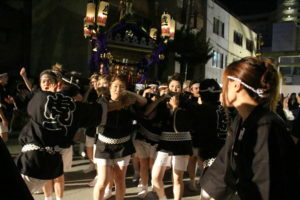 Participating people in town council are living for “festival” every day including preparation period. 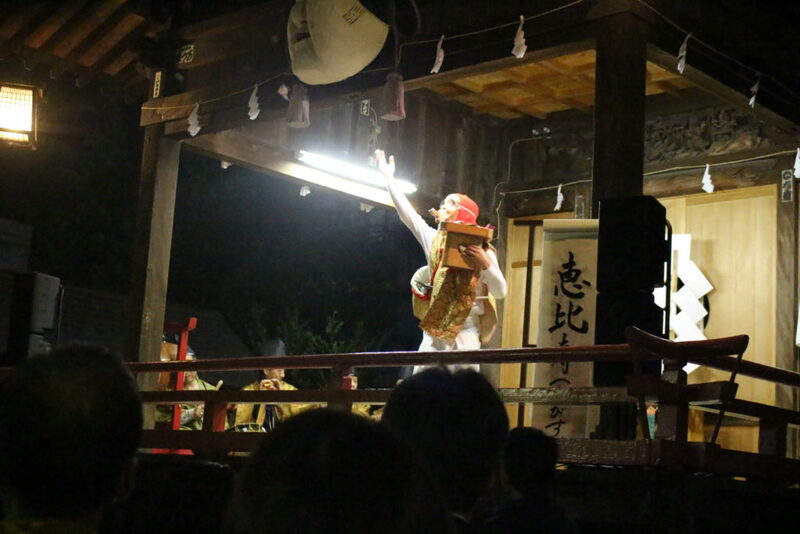 Many people usually live far away so we can see them only during festival. 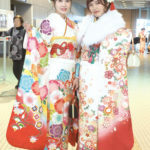 I think people are attracted by happiness and nostalgia which they felt at the festival when they were children. 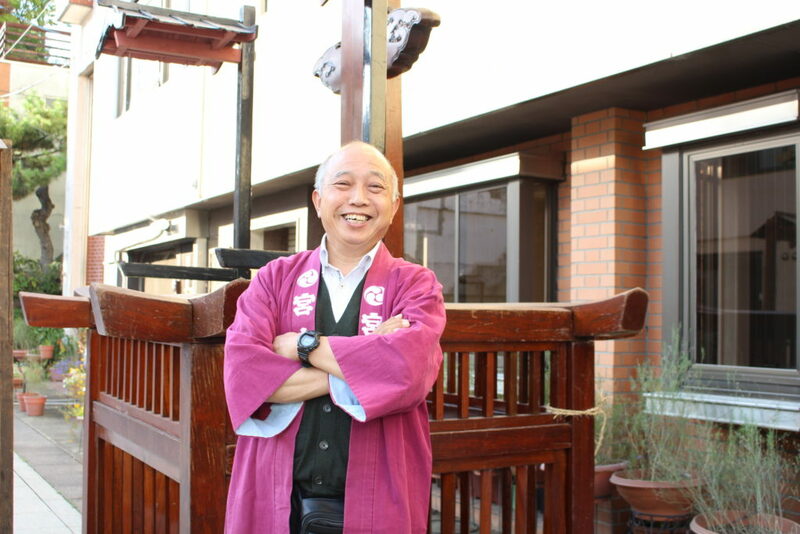 We interviewed Mr. Teruji Takano who is a secretary-general of the society for preservation of Hachimanbayashi. 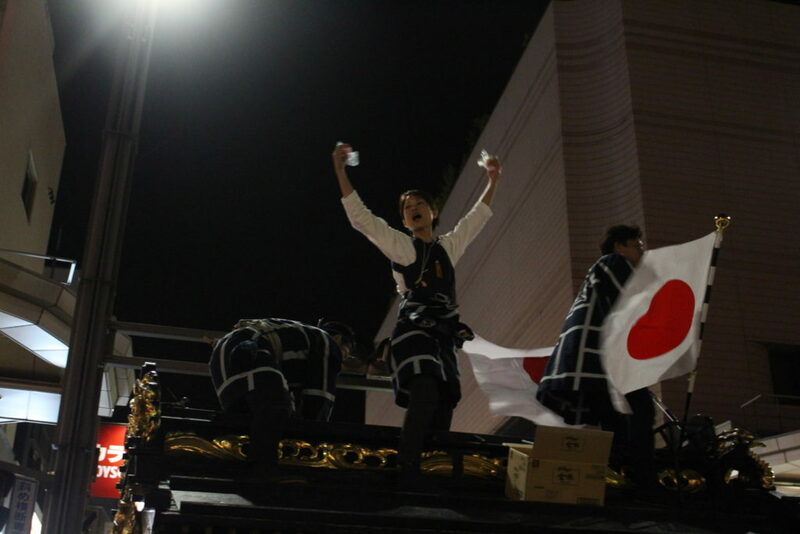 What is the highlight of Dashi Festival? 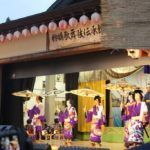 I think performance of “Ohayashi-kurabe” dedicated by children and “Dashi festival” in the main festival are the highlights of the Hachimanbayashi. Is there anything you want to pass on to the next generation? There is something they can get only by practicing seriously. It will benefit for them. For example, it may cause injury if they don’t grab drumsticks properly. Young children are watching them and we want them to feel that. Gods are also watching them. 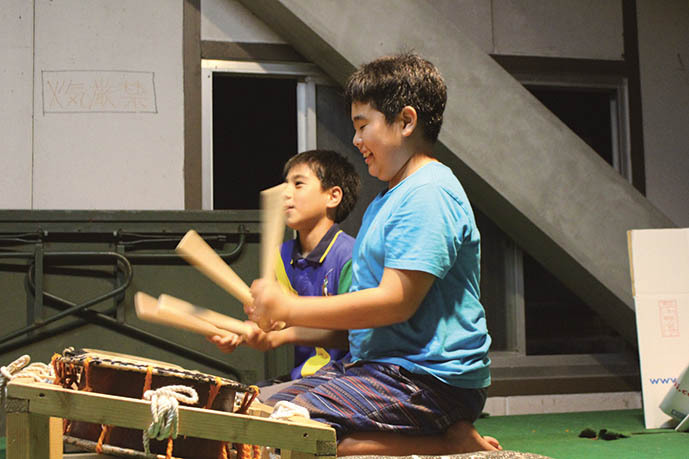 Children from each town council take turns to play “dedicated performance” for about 40min from 4:30pm on 27th in the precinct and Kagura hall of Asakakunitsuko-jinja. 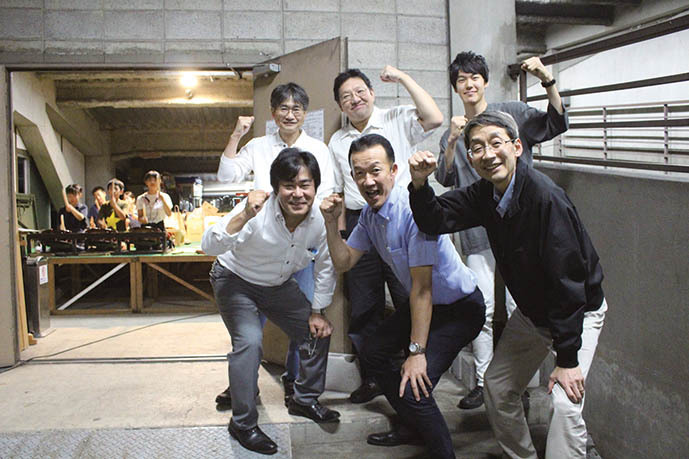 We interviewed Mr. Takahiko Sugiyama who is a chairman of Miyamoto youth association. 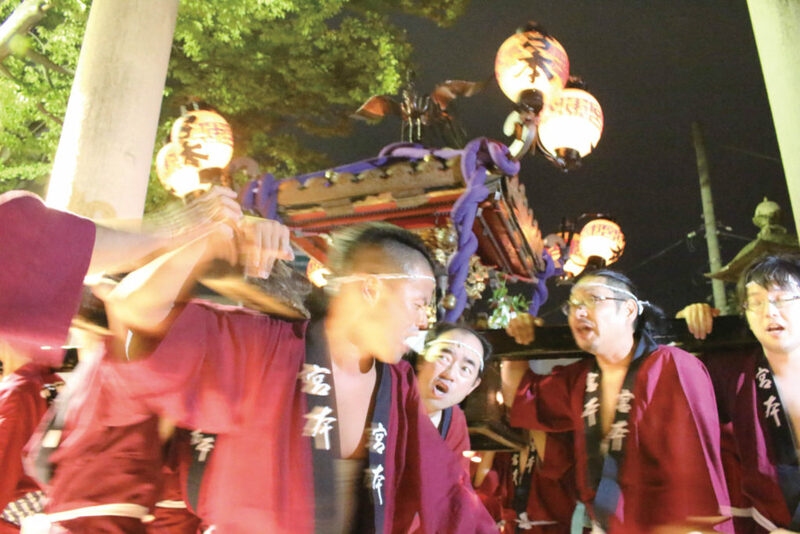 Could you please tell us about Mikoshi? One Onnna-Mikoshi was added in 2017 and total 34 Mikoshi participate in Kangyo right now. 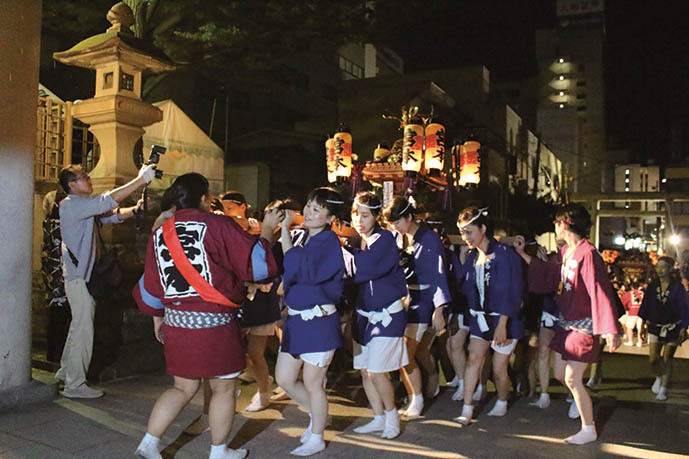 Mikoshi from each town cheer up the festival as a leading guide for Hon-Mikoshi. 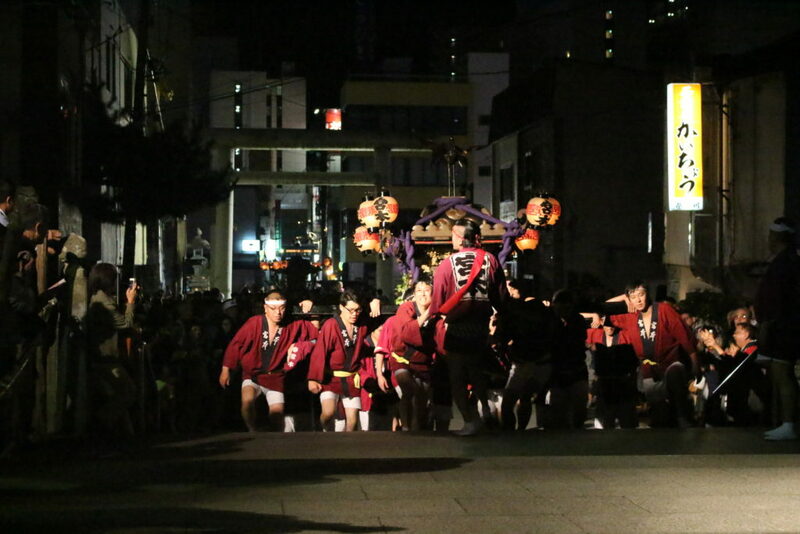 The shape of Koriyama’s Mikoshi is “Edo-Mikoshi”. It is different from shrine shaped “Miya-Mikoshi” that shows up in a solemn parade and is resistant to the rough movement. It looks sharp with wide roofs. “Running, turning, and carrying” are the main movement and we can also shake up and down while carrying with “Wasshoi” shouts. 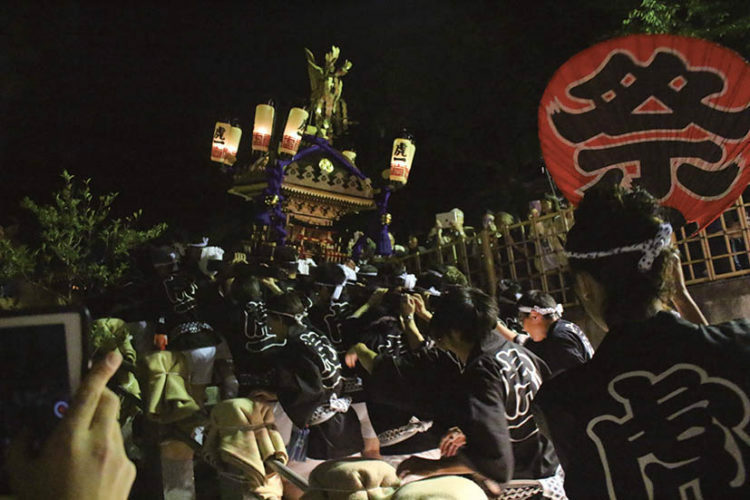 How do you decide the position of Mikoshi? It is mostly decided according to the height. Taller people carry horizontal bars as they are placed on vertical bars. 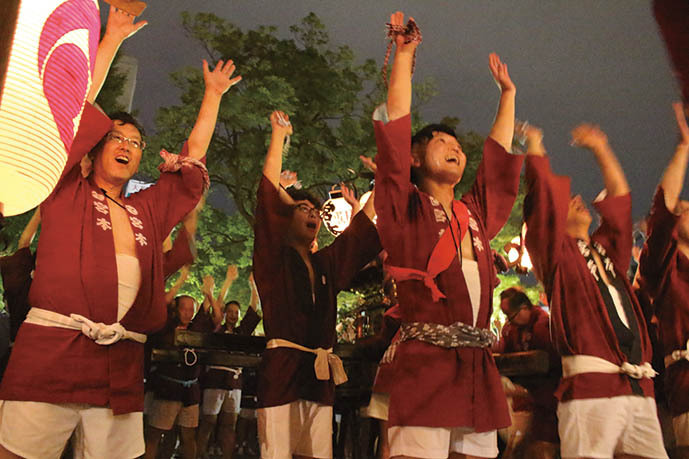 How do you enjoy watching Mikoshi’s Miyairi? 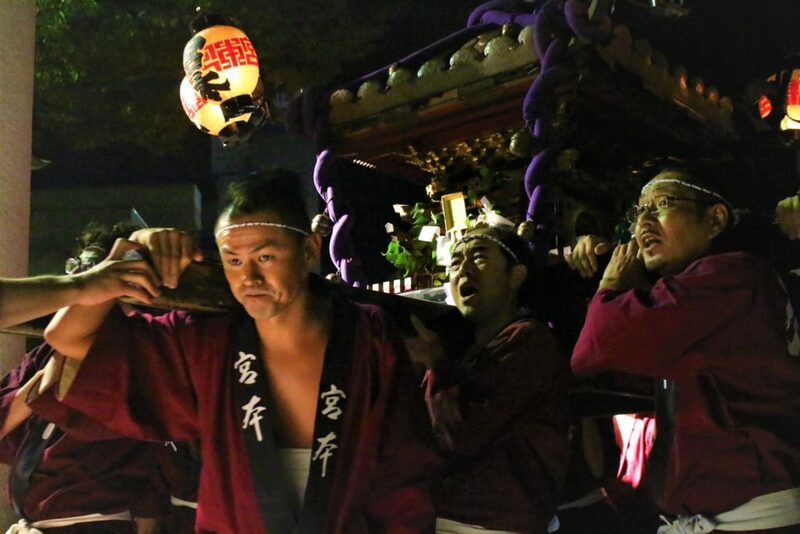 When Mikoshi is going back and forth and not coming up to the shrine, I lead bearers to Omotesando telling them gods do not intend to go back to the shrine yet. It is the hardest moment for bearers as they have to go up and down the stairs. 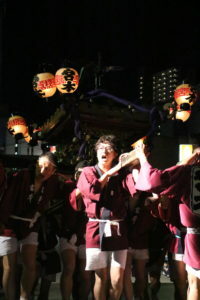 Especially, it is physically challenging for bearers of the third Hon-Mikoshi as it remains there until the end of Kangyo. Are there any wrap-up party and other events among participants? 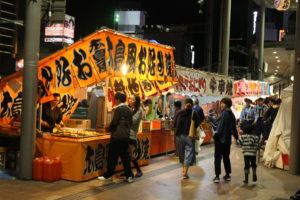 We have “Naorai” where we have meals and drinks together after the festival. We celebrate our safety return without any injuries. “Naorai” sometimes finishes after midnight when “Miyairi” occurs past 10pm. We feel sad to know that some towns are not able to take out Mikoshi and Dashi due to shortage of hands these days. Let’s work together to cheer up the festivals and maintain our wonderful traditions.